The VG-RELAY-DC board is perfect for controlling traditional sprinkler valves, pumps, or interfacing to other control systems. It interfaces directly to Vegetronix soil moisture sensors. Because it uses a 5A mechanical relay, it can directly control higher power AC or DC devices. 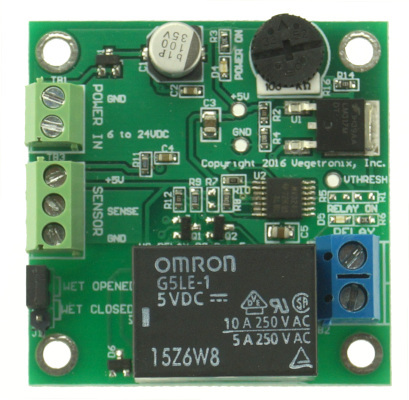 It has 2 LEDs to indicate that the board has power, and the on/off state of the relay. The VG-RELAY-DC board interfaces to a single VH400 soil sensor, and can activate a high power AC or DC load such as a valve or alarm, or other control device, when a moisture level is reached. The threshold is easily set with the onboard variable resistor, and a small screwdriver. The relay board can be configured with a jumper to turn the relay on when the sensor detects wetness or on when the sensor detects dryness. The VH-RELAY-DC also serves as an evaluation board. If you are thinking about testing our VH400 soil moisture sensors you should consider purchasing this board as well. Powered from a wide range DC supply. Can control a 5A 250V load. Vegetronix offers a variety of relay boards for nearly every application. See our Relay Board Selector Guide for help in determining which board is appropriate for your application. Supply Voltage 6V to 24 VDC.